Yes I have jumped straight back into page 10 of The 20 Project (bypassing 2-9), but I have a very good reason! I had also planned to do something else for my first videos, but in the end it doesn’t matter. I have begun and the next video will be even better. I'll come back to those other ones. Scrapbook Roulette is when a number of items or techniques are randomly selected and must be used on the layout. Claire has been doing this for a while and selected 5 embellishments for us to use. We were free to use whichever paper, cardstock, theme, photos, alphas or mixed media, but we could ONLY use the embellishments from the draw. Pretty tough since stickers and enamel dots were not allowed among other things. I often have days where so much stuff goes wrong that you couldn't make it up. This was one of those days. Every possible technical disaster happened. Eventually I headed over to my sister's house with my stuff. She is set up to record videos for YouTube. Even then we had some dramas and her stuff wasn't handy so I really appreciated her pulling it all out and working the camera for me...not to mention all that editing! There will be a next time, but I will make sure I have things set up in a more or less permanent arrangement in my craft area the way I want it. Some of these lovely ladies also blog, so please show them some love there as well. Day 10 of The 20 Project. 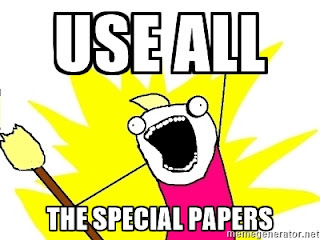 Day 10...Today's challenge is all about not hoarding the pretty paper. Shimelle's layout was fairly simple and she let the paper did the talking. It was a very striking sheet of paper and while I had it in my stash, for ME it wasn't so special. I think I even bought it for the B-side! Shimelle also used a special occasion photo for her layout and I was not. This makes a difference to paper choice I think. 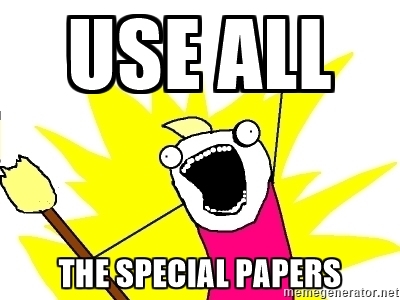 When I thought about all the papers that are 'too good' to use - the vellums, acetates and glittered sheets - are always among the first to come to mind. I DO buy multiple sheets if I really like them and lately I keep returning to the raindrop speciality paper (called Chai) from Shimelle's second collection - True Stories. I'm please to say I've used the film strips ( Shortbread) and the glittered diagonal stripe ( Blueberry Muffin) before (on the b side though!). It's at this point that things happen fast. I start being peppered with ideas and since I had a story I have long wanted to tell (involving rain), I thought I should just use ALL the papers, right? I thought I'd try sticking vellum strips in the white areas here and there (ripping them off if I didn't like the way it looked). The cloud vellum (Earl Grey) is more sparse than the one with hearts (Chamomile), but I needed Earl Grey/the cloud one. In fact, after deciding to undertake this hybrid project of sorts, I kept finding cloud/umbrella/raindrop motifs in my stash. Go figure! I have noticed after I've had a few weeks (or longer) away from scrapbooking, I find myself wanting to use EVERYTHING...maybe because I can't be sure when I will scrap again and so I want to cram all my favourite motifs on the page...hich just doesn't work and leaves me feeling...less happy with my layout than I might otherwise. The other thing I may have done a little differently, is cutting a bigger box from the Chai/raindrop paper...and maybe smaller mats for the others...and reining in my wild embellishment sticking frenzy a little bit. My next BIG challenge is teaching a group of up to 20 kids at my son's school next month for what they call Passion Day. Perhaps it should be called Obsession Day instead? Thanks for visiting! I had a lot of fun.